Delilah Dickinson owns a travel agency in Atlanta. Her agency specializes in literary tours. 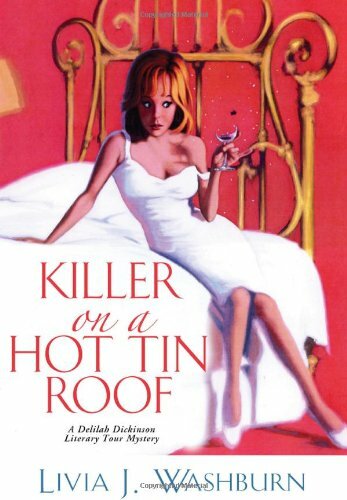 Killer On a Hot Tin Roof begins at the airport in Atlanta. The professors signed up to go on the tour are tending to act more unruly students than adults. The tour is headed for New Orleans and for the annual Tennessee Williams Literary Festival. Delilah is glad to have Dr. Will Burke along as a member the group. Will is a professor and Delilah’s current romantic interest. Delilah breathes a sign of relief when she finally gets the group to New Orleans and settled into the St. Emilon Hotel located in the French Quarter. However, for Delilah the trouble was just beginning. Dr. Michael Frasier, one of the professors, has brought Howard Burleson as his guest. Burleson is an elderly man who shocks everyone when he announced that he and Tennessee Williams were lovers. Burleson also claims that he actually wrote Cat on a Hot Tin Roof, not Tennessee Williams. Each member of the tour group has his or her opinion as to whether Burleson is telling the truth. Frasier is upset that Burleson has let the cat out of the bag regarding his past but when Burleson is found murdered, things get even more complicated. Frasier accuses Dr. Tamara Paige of murder and the police buy into Frasier’s theory. The entire literary tour consisted of interesting characters, each with their own unique story. When Delilah finally gets her fill of lust, greed, murder and emotional turmoil, the highlights of the literary tour, she makes up her mind to find the murderer and get the remainder of the group back to Atlanta. Livia J. Washburn has written a mystery full of humor and some interesting bits about New Orleans and Tennessee Williams.